The United States of America celebrates President’s Day on the third Monday of February. This celebration has quite a long history. At first, it was established as the observance of George Washington’s Birthday and was held on February 22. Then, after the Uniform Monday Holiday Act was enacted in 1971, it was moved to the third Monday of February. It is still officially called Washington’s Birthday. Let’s see what we should know about this holiday! After President Washington died in 1799, his birthday became the day of remembrance, since this man was considered the most significant figure in the United States. Some of the most important celebrations were Washington’s centennial in 1832 and the beginning of the Washington Monument construction in 1848. In the late 1870s, Washington’s Birthday became a federal holiday in the USA. The proposition to take this step came from Senator Dorsey and was signed into law by President Hayes in 1879. At first, it applied only to Washington DC, but then, it was expanded to other states. It was the first federal holiday that celebrated a person (the second one was Martin Luther King Jr. Day that became a federal holiday in 1983). At that time, it became the fifth federal holiday in the USA, after Independence Day, Thanksgiving, Christmas Day, and New Year’s Day. In the late 1960s, the Congress proposed the Uniform Monday Holiday Act, following which some of the federal holidays were shifted to predetermined Mondays. Thus, Washington’s Birthday was shifted to the third Monday of February. It was done with the aim to create additional 3-day weekends for American employees. Since President Lincoln was also born in February, many people considered that Presidents’ Day was to become the celebration of the birthdays of these two American presidents, both of whom were prominent figures and deserved recognition. 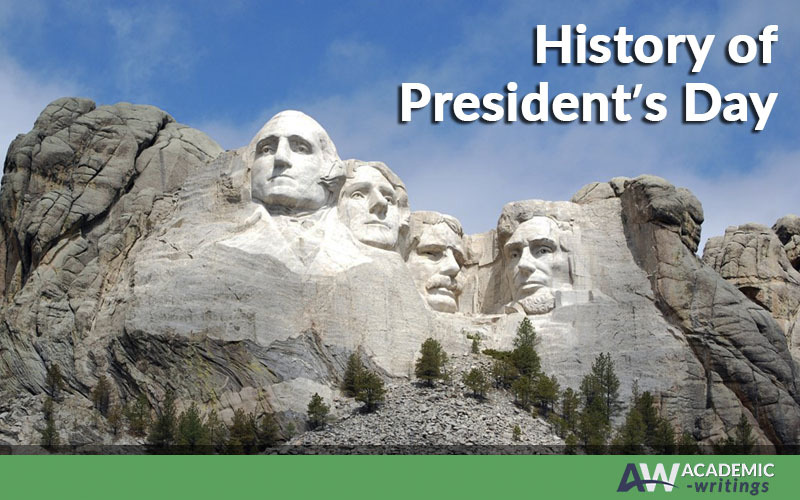 This day acquired its common name, Presidents’ Day, after marketers seized the opportunity to increase sales and advertise their stores, using this day. This holiday became known as Presidents’ Day to most Americans in the mid-1980s. Many states changed the name in their calendars and some of them even added other political figures to the celebration. For example, Arkansas also celebrates a civil rights activist Daisy Gatson Bates, while Alabama commemorates President Thomas Jefferson. Most Americans celebrate Washington, Lincoln, along with other prominent political figures of the USA, even though some people oppose this tradition saying that it minimizes Washington’s legacy. One way or another, this holiday is still officially listed as Washington’s Birthday. Presidents’ Day is considered to be the day of remembrance and patriotic celebration. It gained a special meaning during the times of Great Depression. Today, at Presidents’ Day, staging celebrations, reenactments, lectures and some other events are arranged to honor Washington and other American presidents. How are you going to celebrate Presidents’ Day this year?